It’s time for me to take center stage and reveal my very own talk trigger. In this episode I explain how I use word of mouth to build my speaking business. 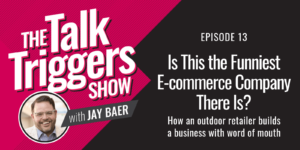 I’ve talked about a lot of businesses and their remarkable talk triggers on this show. But, now it’s time for me to take center stage and reveal how I use word of mouth to build my own speaking business. I’ve been a professional speaker for over a decade and let me tell you, it’s not an easy business. The competition is ferocious, and it’s only getting harder to stand out. There are more professional speakers than ever. And, we all want the same thing. A podium and a microphone. So, where does that leave me? Lost in the crowd? Desperately banging on the door of every meeting planner I cross paths with in hopes they’ll hire me? Of course not. I wrote a book on talk triggers. I host a show all about talk triggers. 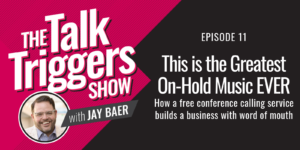 You can bet that I’ve got a talk trigger up my sleeve that sparks conversation and appeals to meeting planners all over. So, how do I do it? What is the unique talk trigger that helps me book speaking gigs? 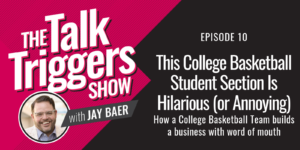 Tune into this special episode of The Talk Triggers Show to find out!